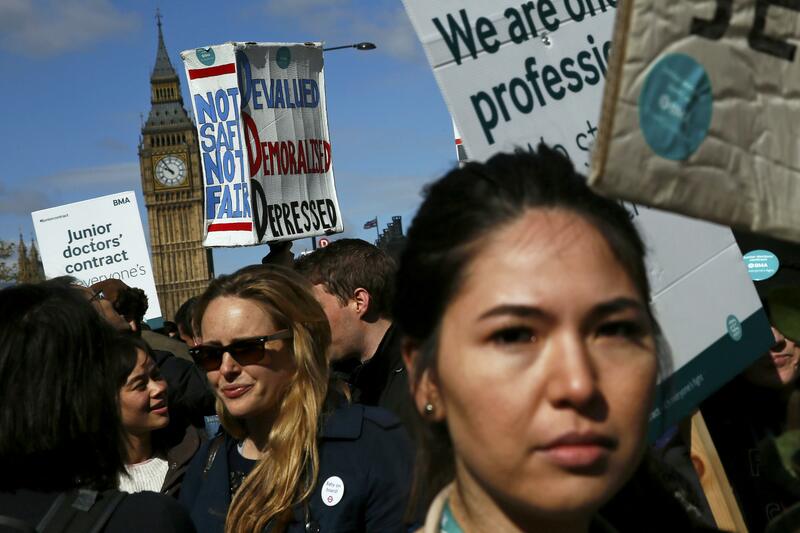 LONDON -- Thousands of junior doctors posted picket lines outside hospitals around England on Tuesday in the first all-out strike in the history of Britain's National Health Service. The two-day strike marks the first time that vital NHS emergency services have been affected by an industrial action. The strike reflects the impasse between the government and the junior doctors, who are physicians with up to 10 years' experience, over the government's pledge to greatly expand National Health Service care on weekends. The financial dispute centers on payment for weekend shifts and whether Saturday should be treated as a normal working day. Health Secretary Jeremy Hunt insisted the government would not be "blackmailed" into scrapping its election pledge to bolster weekend services. He said that promise was a centerpiece of the Conservative Party's platform in the 2015 election. "I don't think any union has the right to blackmail the government, to force the government to abandon a manifesto promise that the British people have voted on," he said. More than 125,000 appointments and operations have been cancelled and will need to be rearranged due to the strike, a result of the long-running dispute between the government and the British Medical Association. Hunt warned the walkout would cause particular risks for patients needing emergency room treatment and those in maternity wards and intensive care units. Mark Porter, head of the medical association, told the BBC that senior consulting physicians would provide emergency care while the junior doctors are on strike. He said the government was misleading the public by claiming the job action put lives at risk. "The Health Secretary is trying to find some way to throw mud at the junior doctors of this country who have been providing weekend and night emergency cover since the NHS started," he said.